Reclaiming the workday lunch break in Old Oakland. 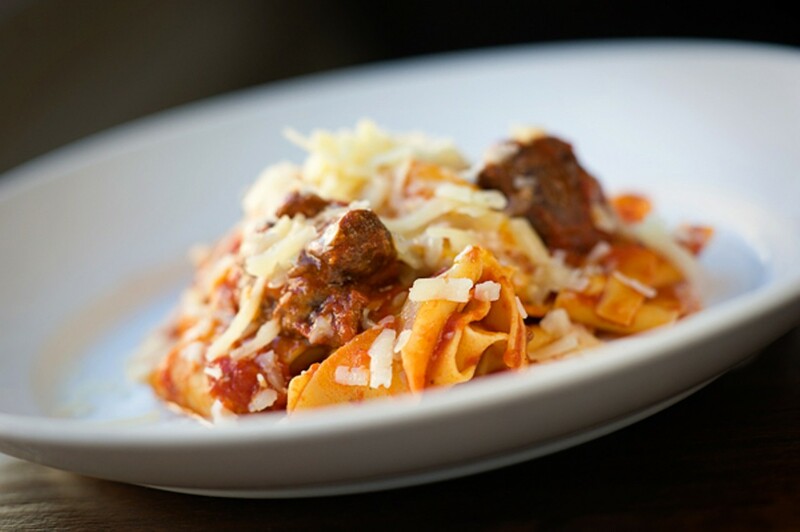 Lamb cheeks set apart Desco's pappardelle dish. Hours: Mon.-Thu. 11:30 a.m.-10 p.m., Fri.-Sat. 11:30 a.m.-11 p.m., Sun. 3-9 p.m. I have on occasion, when faced with a looming deadline or having finished a Hemingway novel, daydreamed about what it might be like to move to the Italian countryside — to strip my life of unnecessary detail, to frolic among stands of olive trees, and, of course, to luxuriate in three-hour lunch breaks. Short of that, I go out for Italian. And these days, when noon rolls around and I'm craving fresh pasta and slow-simmered tomato sauce, I've found myself drawn to Desco, a cozy Italian spot that opened in Old Oakland this past summer in the space most recently occupied by Borgo Italia. Perhaps more than any other Italian restaurant I've been to recently, the place offers a rare reprieve: an escape to a bustling, bona-fide Italian cafe. Look, there are a few Italian restaurants in the East Bay that serve food that's a little bit more refined or more perfectly executed. And anyway, there's nothing a restaurant can do to change America's culture of workaholism, or to give you a longer lunch break. But Desco does offer a nice compromise: a hearty plate of pasta cranked out quickly enough that anyone working near downtown Oakland can enjoy a civilized meal and still get back to the office with time to spare. 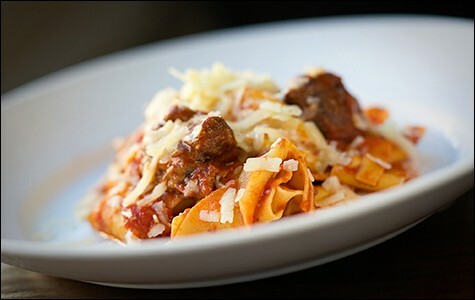 Chef-owner Donato Scotti opened Desco as a more rustic, casual spin-off of his Redwood City restaurant, Donato Enoteca. Though he touts his use of sustainable (often locally sourced and/or organic) ingredients, Scotti said the food is meant to be simple and comforting in a way that befits the coziness of the historic 19th-century building that houses the restaurant — traditional dishes plated without pomp or fuss. The food is "Italian-Italian," not red sauce Italian-American or a California-fied fusion, but broad-ranging in its regional specificity: The wood-fired pizzas are done in the traditional Southern Italian styles of Naples and Tuscany while most of the pasta and panini options hail from the Emilia-Romagna region to the north. The lunch menu covers the greatest hits of the restaurant's full pizza-and-pasta repertoire. As an added bonus, each dish is priced about $2 or $3 cheaper compared to the dinner menu, though according to Scotti the portion sizes are the same — which is to say very filling. Standouts included the casonsei, a dish traditional to Scotti's hometown of Bergamo (northeast of Milan), and the fresh pappardelle tossed in a lamb-cheek-and-red-onion tomato sauce. The former, plump stuffed pasta with dimpled, frilly edges, reminded me more of Chinese pork dumplings than they did traditional ravioli (thanks, Marco Polo!). I loved the juiciness of the ground-pork filling, which incorporated bits of prosciutto, amaretto cookie crumbs (for a hint of sweetness), and a touch of wine. But what made the dish gloriously decadent was the topping of crispy guanciale (richer and more bold-flavored than bacon) and fried sage leaves, and the pool of toasty browned butter underneath. The pappardelle, on the other hand, wasn't quite as delicately tender as I would have liked, and the red-onion sugo, while enjoyably savory, was the kind standard tomato sauce you can get at any of the city's nicer Italian restaurants. But what set this dish apart were the lamb cheeks, which were slowly braised in that sauce and presented whole: three or four big hunks of unctuous, tender flesh. Meanwhile, a plate of penne arrabiata, which was fairly aggressive with the Calabrian chili peppers — a better-than-average rendition of the classic comfort dish. During another visit I tried a schiacciata, or "stretched" pizza, which Scotti describes as a kind of cross between a thin-crust pizza, a flatbread, and a focaccia. The one I ordered had a soft, somewhat bready whole-wheat crust and a pesto that could have used more punch, but I did enjoy the pleasantly oozy layer of crescenza cheese. More interesting, and less expensive, than the pizzas were an array of panini — some served on thick slices of ciabatta, others on an olive-oil-based Romagnan flatbread known as a piadina — that are only available during lunch hours. My piadina desco, which, like the pizzas, was served on a small wooden board, was filled with thin slices of pork belly (cut from a whole belly that's roasted like a porchetta), asiago cheese, and sauerkraut-like braised cabbage that added some crunch and acidity to cut into the richness of the dish. Desco is also open in the evenings (desco means "dinner table" in Italian, after all), though I found the salads and entrées we ordered to be somewhat uneven. A salad of grilled Monterey baby calamari, for instance, featured truly excellent squid — smoky from the grill and perfectly tender. But the salad portion, which consisted of baby Romaine lettuce and a whole mess of cannellini beans, had barely any dressing, so the dish was far too starchy and dry. Similarly, the pork ossobucco, served on the bone, was impressively hefty but under-seasoned, and while an accompanying tomato sauce was delicious, there was far too little of it. Diners familiar with either of the historic building's two prior occupants, Borgo Italia and B Oakland, will recall that the dominant feature is the big floor-to-ceiling picture windows that line two walls of the dining room, facing out toward the heart of Old Oakland. Day or night, there's hardly a more charming space in downtown Oakland. At mid-day, it's a great place to grab a seat by the window and people-watch. In the evening, when the old-fashioned street lamps outside light up, the atmosphere turns positively romantic.